Frieda Loves Bread: Peanut Butter Cookie Day! 0 Peanut Butter Cookie Day! 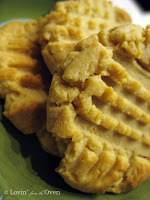 Did you know that today is National Peanut Butter Cookie Day? I didn't know either, until I stumbled upon some baking blogs talking about it. So, celebrate by baking some of these soft, chewy, peanut butter goodies! If you want to enter in a great giveaway for a new toaster, click and comment here! Today is the last day!